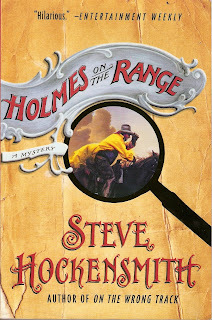 If you like Sherlock Holmes and/or Westerns, this is an excellent book; although it's rough on the language and setting. However, it is written from a cowboy's understanding in the late 19th century Montana. Two brothers, Gustav and Otto Amlingmeyer, Old Red and Big Red respectively, sign up to work on the Bar VR because they need some money despite the ranch's bad reputation. Turns out there's more to the Bar VR than chores and cattle and Old Red is aimin' to find out with Big Red following in his brother's boot prints. During an outing, the boys come across a corpse. Then later, they find another corpse in the outhouse. Old Red is a huge Sherlock Holmes fan after reading "The Red-Headed League" and he starts deducifyin' what happened to those two bodies and what really happened at the Bar VR before the Amlingmeyers share the same fate. Turns out, Old Red ain't too bad at detectivin'. The line that did it for me is "Some folks get religion. Gustav got Sherlock Holmes." Being a Sherlockian myself, I had high hopes for this book and it didn't let me down. The plot was brilliant, the characters developed nicely, and the setting made me feel like I was actually in Montana in the 1890s without the sights and smells. Another bonus is Holmes is "real" in the story, not a fictional character. The language and scenes tend to be rough in spots, however the narrator is a cowboy and is reporting things as seeing them, but this just seems to add that much more to the story. Another odd touch which probably appeals to Westerns is the use of the double title, such as: Prelude Or, the Calm Between the Storms. I have never been one for the double title. I always felt it should be one title or the other. However, I think Hockensmith pays excellent tribute to the Westerns with this technique so it didn't bother me. This book is by all means not politically correct, but I think it holds up as a story written in that era nor do I think it detracts from the storytelling. First, I must say our blog has officially exploded. This is the 30th review in February so far. 30. In 5 days. Yeah. Second, what is it about Holmes that makes authors want to write about him as if he was a real person? I've seen that in a lot of places, and it's mindboggling. Maybe if I ever read some of those Holmes stories, I'll understand, but at this point, it's a little beyond me. Holmes is such a larger than life person and for me, personally, it's the author's wish that Holmes was real. Many people in London viewed Holmes as a real person, even publicly mourning his "death." One of Doyle's daughters said when the author was writing the stories, it was like having Holmes in their homes, sharing dinner and such. Perhaps, it's wishful thinking. I like Holmes too and am a big fan of Doyle's stuff. I might have to try this one.